Island trippers have another reason to visit Siargao, the Philippines’ surfing capital — the new Siargao Wakepark. Founded by Belgian Tom Soupart and opened in July in the small town of Consuelo, the wakepark is a short 10-minute drive from the main excitement in General Luna. It comprises two man-made lakes, surrounded by coconut trees, and has a lakefront hut, where you can relax while sipping cold drinks. The sport might even be easier to pick up than surfing. Wakeboarding movements — which feature aspects of surfing, water skiing and snowboarding — are facilitated by the pull of a motorboat or, in this case, an overhead cable. A flat board, fitted with boots, allows people to glide through water, while holding on to a towing rope. “It’s so simple that there hasn’t been a single person that’s left the park without having learned how to stand up and ride with a board,” says Tom. Still, the park emphasizes safety: Anyone who wants to give it a go must always have a life jacket on; must use the designated entry and exit points; and must listen carefully to instructions. With plans to install overhead park lights, wakeboarding in Siargao can soon be done even after the sun goes down. 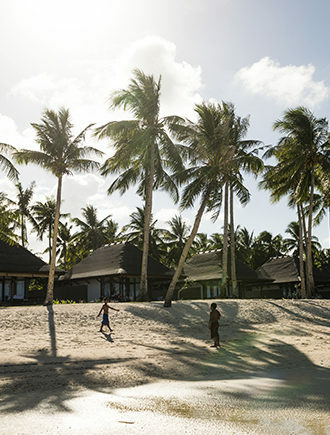 “It’ll be an activity in Siargao that people can do, regardless of the weather or time of day,” adds Tom. No waves at Cloud 9? No problem.